Some great variation about ratings and opinions have taken place early on, at the very first date of the Fallout 4's release. This may well be the most controversial Fallout game of the series yet. While looking at Metacritic.com user and critic scores, you can see a big difference on where the average score leans upon. The early Metacritic user ratings indicate a HUGE disappointment in the game (on average level), while critics (game magazines etc.) have much high scores on the average. One may only wonder, what creates such big gap between the two parties? It all seems rather fishy on the side of early critic reviews. Without making any accusations, I would just like to state that game development and running game magazines are business models among many others, and paid reviews DO exist in gaming world. Not claiming it's the case here, but it certainly has happened before. It may be too early to say where the final user average rating score will drop, but early signs promise no good. EDIT 13/11/2015: and the Metacritic user scores seem to be continuing to sink as the first days since the release pass by. Now that is a big difference betweem critic scores and user scores, which one doesn't see too often on Metascore! Don't get me even started. Calling those scores "good", and calling the game "good" based on those scores would be a pure lie or ignorance. Should the percentage of negative user scores out of the total scores remain somewhat similar, than what they are currently, then this would only indicate that the fans except Bethesda to do some major chances and improvements for the sequel, should they ever come up with another Fallout game in the future. Scores like this would probably mean the end of Fallout series the way they are designed and presented currently. The fans seem to demand the next game to be something totally different. One third of console gamers give Fallout 4 a negative score, and slightly over half of the PC gamers think the game deserves a negative score (which, by the way, is more negative than positive votes, because 273 votes on PC side went to "mixed" category, which makes it 1528 negative votes VS. 1230 positive votes!). Also, if you compare the current Fallout 4's ratings to the ones of Fallout 3, it also indicates a major drop in fans satisfaction rate. And we are comparing Fallout 4, the game which is similar to it's predecessor in most aspects - to Fallout 3, which was more controversial per se, because it changed the whole core game play compared to it's predecessor Fallout 2, thus probably receiving more "rough treatment" by older fans of the series, than what Fallout 4 should had. Way or another, Fallout 3's user rating scores seem superior in any aspect. "If you’ve been waiting for Fallout 4, it will simultaneously meet your expectations and exceed them in others. Who would have thought a Fallout game would convince us of Bethesda’s storytelling and shooter credentials? In a year full of brilliant open-world games like The Witcher 3, it manages to stand apart from the crowd and deliver something that feels fresh, despite its familiar foundations." "Graphical niggles aside, Fallout 4 feels like a culmination of the fantastic work Bethesda did on Fallout 3, New Vegas and Skyrim, surpassing them all in terms of scope and scale." "A huge game that's anything you want it to be. An immense RPG, shooter, and world to explore that is only constrained by your imagination and desire to explore." "Fallout 3 was seven years ago. Fallout 4 is one you can play, off and on, for the next seven. Congratulations, Bethesda: You’ve outdone yourselves again. You’ve made the Wasteland more beautiful, ugly, open ended, funneled down, thoughtful, and frantic than ever." "Great new reasons to obsessively gather and hoard relics of happier times, strong companions, and sympathetic villains driving tough decisions make it an adventure I’ll definitely replay and revisit. Even the technical shakiness that crops up here and there can’t even begin to slow down its momentum." "Fallout 4 is an engrossing game that lures you in with mystery and the promise of adventure. Its wretched wasteland can be captivating, and you never know what odd person or settlement lies around the next bend." "A quick summary for any of you page scrollers: If you're a fan of fallout (particularly NV), you're going to be majorly disappointed. If you're someone whos a big RPG fan, you're going to be disappointed. If you're neither of those you might have a good time with the game but if you do i strongly advise you whip out the last gen systems and play FO3/NV (Especially NV). Now for a more in depth look at this game. First of im going to list what was improved upon, because though the game is bad i feel like for this to be a fair review these FEW things have to be acknowledge. 1. 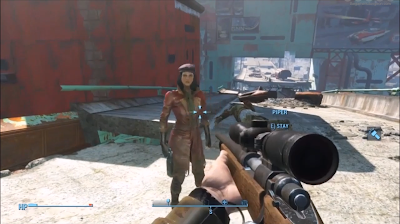 The gun play is the improvement every Fallout player was hoping for. Its still not a perfect system, but its leaps and bounds from the last iterations of the franchise. 2. The character creation is pretty fantastic, though the graphics dont allow this to shine as much as a graphically more impressive game would. 3. The settlement feature is fun and adds quite a bit whilst being completely optional. 4. Voice acting is much improved in terms of voice variations. Some of it still sounds poorly read. 5. Animations all round are better (but again, not perfect or anywhere near) which leads to more interesting fights, different enemies have much more varied attacks than before. 1. Dialog wheel, dialog wheel, dialog wheel. When. Will. RPG Devs. Learn. I dont understand how this idea got past in a meeting. There have been numerous RPG's which have implemented this along with voice acting from a more traditional system and precisely ZERO have gotten better because of it. Did no one learn from the travesty which is now the Dragon age series? It limits what you are able to say/ask. You get limited information on what you're going to say which can lead to ridiculous encounters where you're blurting out stuff that is completely different to what you thought. And to implement it into a game the WHOLE dialog system has to be dumbed down, no skill related conversation options - what replaced it is pitiful and not fit for purpose. 2. The environment is very boring from my experience. The major city in this game is ludicrously small and the map is not much better. There are a lot of side quests and encounters but im talking just the general environment, it all looks very similar and dull to the eye. Boston is the weakest setting so far. 3. You dont appear to have much of an impact on the world, much like Skyrim. This is no Witcher 3 ladies and gents, Bethesda got this completely wrong and makes major decisions seem trivial. 4. A very black or white morality with no reputation system or karma. IMO a step backwards for the series as it could have been improved upon from that last games and been made into a really enjoyable and in depth mechanic. Bethesda decided to scrap it instead. 5. The perks...lord, the perks are terrible. Not that what they offer is bad, or even that there isnt variety. Just that without a skill system it all seems rather empty and shallow. Again, instead of improving upon a mechanic that people liked that just scrapped it to make it simpler. 6. Your companions are just as dumb as the were before if not more this time. I swear dog meat spends more time in front of me in doorways than he does following. Again, you cant switch them from ranged to melee anymore, you can change how they fight. Another mechanic which could of been improved upon and made brilliant but instead was scrapped for a simpler less satisfying and frankly annoying system. 7. The story has MAJOR pacing issues. Its all over the place, gets good after a few hours in but Bethesda needs to hire some better writers because it doesnt hold up with other game of the same genre. Not even close. 8. New legendary monsters. This one might be just me because what they've chosen to do is a creative choice rather than just a bad decision. But basically its like borderlands. You get random really strong monsters on side quests or when you're exploring and they drop better loot. But calling them legendary really waters down the experience of fighting them. After fighting 'legendary' mongrels that are less than two feet tall and somehow take twenty bullets on normal difficulty the system just seems really stupid and arcadey. It doesnt suit fallout at all. I hope to god they take it out i feel like im playing some god awful MMO. In other Fallouts named raiders etc would be exciting, because they're characters, and they might have a story behind them. But now they just fade into the abyss of endless slain legendary enemies who sponge bullets. It waters it down. "Quite disappointing. Don't believe the positive "professional" reviewers. This game, again, showed what a bunch of paid-off hacks they are. A lot of the things that made the previous Fallouts so fun are just dumbed down or broken in this latest instalment. The dialogue system is just pure garbage. I don't see any point in RPG style charisma play through what-so-ever, which is something I did in all previous Fallouts. The story so far, well, it's the same beginning as in every other Fallout really. However, the story progression and the NPC's you meet are extremely one dimensional and I actually feel like murdering them all rather than having to suffer through the painfully uninspiring dialogues. I personally do not care for the graphics that much, which seems to be a major gripe for a lot of people, but this game is just not up to par in next gen gaming. What's worse is that it is actually VERY difficult to spot enemies without using VATS due to the "improved" graphics, particularly when compared to New Vegas. At launch, it is filled with bugs and **** The framerate is at times abysmal. The character gets stuck on invisible obstacles, and so forth. If it wasn't a Fallout game, I would have quite playing after the first 4 hours. As we can see, the early opinions fluctuate a lot. Debate and controversy is in the air, more than than when Skyrim, Oblivion, or even Fallout 3 was released. There's a lot of disappointment in the air, too, looking not by the above examples of reviews, but by average scores. Critics still favor the game so far, though. Why not buy it yourself and find out? Order Fallout 4 here. Just know, that you might be one of those disappointed fans, since there seems to be many.